While the Stanley Cup Playoffs are gearing up for the conference semifinals, most of the top European leagues have already crowned their champions for the 2011-12 season. The KHL's Gagarin Cup final is going to a seventh and deciding game on Wednesday between Avangard Omsk and Dynamo Moscow. The other major circuits -- including Sweden's Elitserien, Finland's SM-liiga, the Czech Extraliga and the Swiss National League -- have concluded their postseasons. 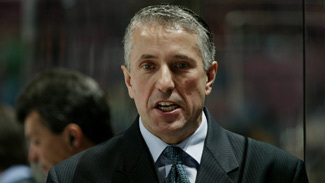 Bob Hartley is no stranger to coaching teams to championships. He guided the Colorado Avalanche to the 2000-01 Stanley Cup after previously winning the AHL's Calder Cup with the Hershey Bears in 1996-97. He can now add the Swiss National League title to his resume. 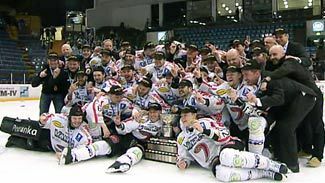 Hartley's ZSC Lions recently captured their seventh Swiss championship in club history and first in four years. The Zurich-based team finished seventh in the regular season, but turned it on when it really counted. The club made a statement with consecutive sweeps of second-seeded HC Davos in the first round and then top-ranked EV Zug in the semifinals. In the finals, ZSC fell behind SC Bern, three games to one. The team staved off elimination with a 2-1 overtime win on the road in Game 5, as Mathias Seger scored the game-winner. Returning to Zurich, the Lions got points from nine different players as they blew out the Bears by a 6-3 score. Former NHL forward Domenic Pittis, who also scored a crucial regulation game in Game 5, led the way for ZSC with one goal and two helpers. The seventh and deciding game in Bern brought a sellout crowd of 17,131 partisans. The game was scoreless until the final minute of the first period, when ZSC's Mark Bastl got his team on the board. Ivo Rüthemann knotted the score at 1:49 of the middle period after the puck pinballed around the slot and finally ended up on Ruthemann's stick on the doorstep. The game remained tied throughout the third period. Overtime seemed inevitable as time ticked down below 10 seconds in regulation. Suddenly, the Lions' Andreas Ambuhl and Jeff Tambellini created a scramble near the net. The puck went out to a wide-open Steve McCarthy, who buried the championship-clinching goal from point blank range. A mere two seconds remained on the third-period clock. "Our team had a big belief in itself," said Hartley to Television Suisse. "We had a lot of pride and character. We never stopped working, and a lot of different players stepped up for us. That's what it takes to be successful in the playoffs." Five different ZSC players tallied 10 or more points during the playoffs. Ambuhl led the way with 14 points (five goals, nine assists) while Patrik Bartschi (nine goals, two assists) led all players in postseason goal scoring. Goaltender Lukas Flueler posted a stellar .947 save percentage in the playoffs. Sporting uniform number 100 to celebrate the centennial anniversary of the Brynäs IF Gävle franchise, Jakob Silfverberg finished off one of the best seasons in the recent history of Sweden's Elitserien in style. He led the team to its 13th championship in franchise history, and first since 1999. During the regular season, the 21-year-old forward led his team and ranked second in the league in scoring with 54 points (24 goals, 30 assists). He was the consensus league MVP, winning the Golden Helmet award. In the playoffs, Silfverberg compiled 13 goals and 20 points in 17 games to capture postseason MVP honors as well and shatter the league's single postseason goal-scoring record, previously held by Daniel Alfredsson. Brynäs got out to a 3-0 series lead over Skellefteå AIK in the finals, but lost the next two games. In Game 6, Silfverberg made a sharp cut and beat Joacim Eriksson to break a scoreless deadlock midway through the second period. The narrow lead held until 7:51 remained in the third period, when Ryan Gunderson, who led all defensemen in the league in regular-season scoring, ripped a point shot home for an insurance goal. Niklas Svedberg (29 saves) took care of the rest for Brynäs, nailing down his fourth shutout of the playoffs. Svedberg concluded the postseason with a 1.70 goals-against average and .947 save percentage in 14 starts. Playoff hero Silfverberg barely had time to enjoy the championship celebration festivities in Gävle. He left shortly thereafter to join the Ottawa Senators for their Eastern Conference Quarterfinal series against the New York Rangers, making his NHL debut in Game 6. Apart from Silfverberg, his linemate, Detroit Red Wings prospect Calle Jarnkrok, helped to trigger the Brynäs offense. Silfverberg was the beneficiary of most of Jarnkrok's 12 assists in the postseason, and the Detroit draftee also scored four goals of his own. The overall scoring leader in the postseason was SAIK's Bud Holloway, who set a new overall playoff scoring record with 23 points (10 goals, 13 assists) during the second-seeded team's run to the finals. An also-ran for much of their 35-year existence, JYP Jyväskylä has become a regular championship contender in recent years. The club won its first championship in 2009 after finishing first in the regular season since 1991-92. Although JYP repeated as the first-place club in each of the next two seasons, it was unable to return to the finals. This season, JYP slipped to fourth in the regular season but hit its stride in the playoffs. The team ripped through Ässät Pori in four straight games and then needed only five games to down Jokerit Helsinki in the semifinals. JYP drew the second-seeded Pelicans Lahti in the finals. After dropping the first game, 2-0, JYP won the next four games by a combined 16-8 score. The Pelicans' Ryan Lasch led all players with 16 points (5 goals, 11 assists) in the postseason after pacing the league in regular-season scoring as well. 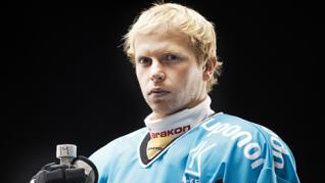 JYP forward Jani Tuppurainen was second with seven goals and 15 points. The improbable playoff run of HC Kometa Brno from the playoff qualification mini-series to the Extraliga finals came to an end in Game 6 of the championship round. After shocking top-ranked HC Sparta Prague in the first round and downing second-seeded HC Plzen 1929 in five games, Brno took a two-games-to-one lead in the finals over third-ranked HC Pardubice before losing the next three games. The turning point of the finals was a 2-1 overtime win for Pardubice in the fourth game of the series. Veteran Brno forward Tomas Divisek led all playoff scorers with 26 points (six goals, 20 goals) in 20 games. Pardubice's Martin Bartek's 22 points (eight goals, 14 assists) ranked second. Pardubice goaltender Martin Ruzicka posted a 2.33 GAA and .928 save percentage in 12 playoff starts.